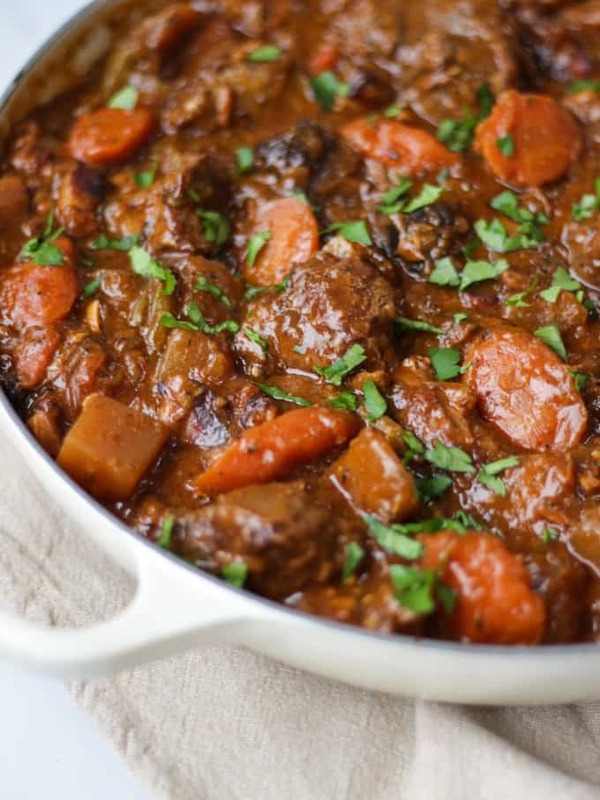 This Beef Guinness Stew is the most delicious, comfort food for cold winter nights. Slow cooked for meltingly soft and delicious beef and ale flavours. This traditional Irish stew recipe can be cooked in the crock pot or oven. It freezes really well and can also be used as the base for a beef and Guinness pie. We’ve almost made it through cold grey February! Whoop whoop. Is spring on the other side of this week I wonder? I do hope so. School run mum life brings a whole new feel to cold mornings. OMG. The school run in the snow. WHAT THE WHAT? It’s a flipping’ trial, sliding up the pavements clinging on to my two little pals whilst holding bags and trying not to fall on my face. I’ve been trying to ease the pain of the freezing afternoon walk by having something bubbling away in the oven or on the hob to welcome us home. 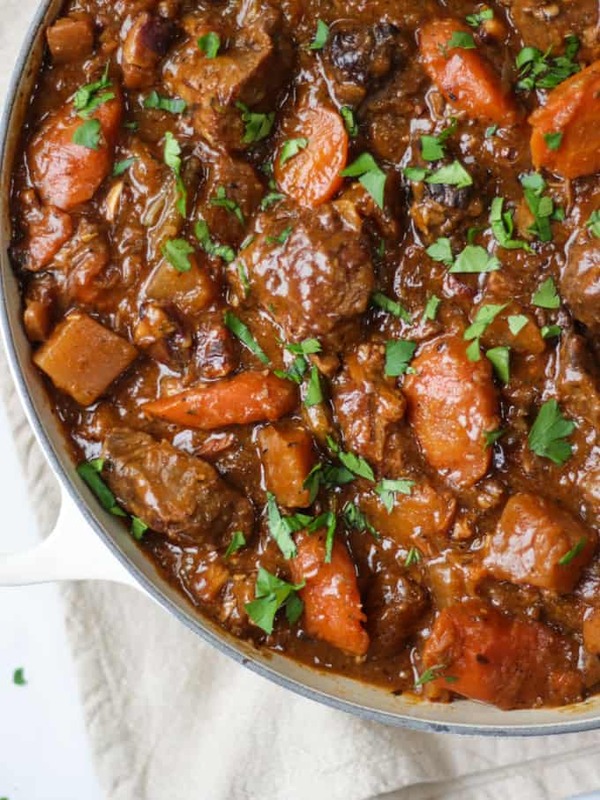 This Beef Guinness Stew is the perfect winter warmer to do just that. This Irish style stew is made really special for two reasons, firstly Guinness, obvs. The dark stout bubbles away giving the sauce a deep richness. Secondly, using a rich cut of beef like shin, really adds to the flavour in my opinion. You don’t need to use beef shin, but it slow cooks down so well, it’s delicious. In my version of this classic beef and ale casserole, I add pancetta for a smokey flavour and onions, carrots and swede for plenty of veggie goodness. Brown everything off, add your liquids and plenty of thyme and pop it into the oven for a few hours. Simple and really delicious. What type of beef is needed for beef stew? 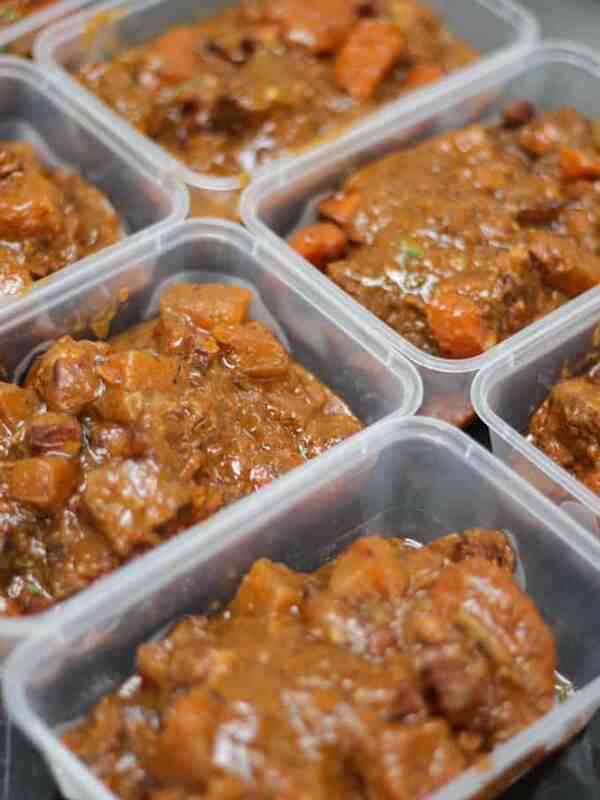 Any type of stewing beef cut will work in this stew, if you’re looking for something lean, try chuck steak cubes. If you can get beef shin from your butcher, it adds so much flavour to this dish. It’s worth hunting it out and giving it a try. Just ask them to trim it well. 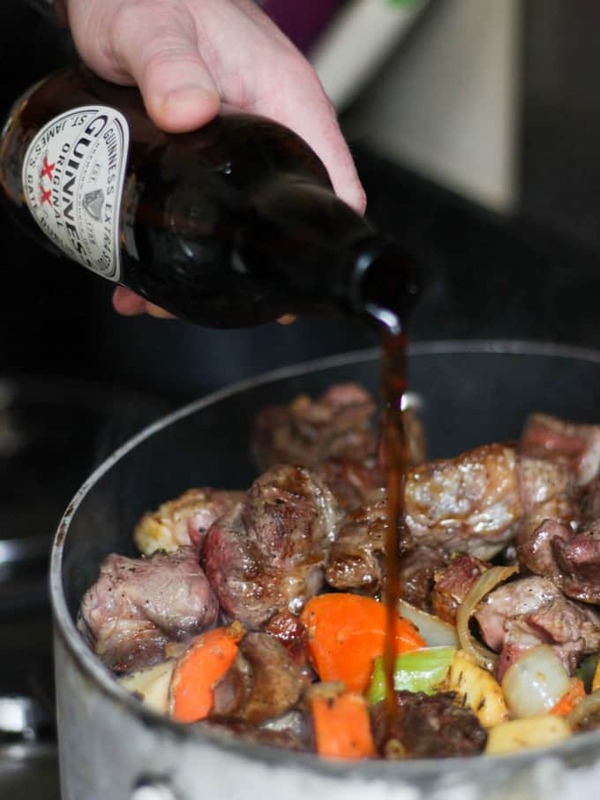 Can I use beer to cook this beef stew? 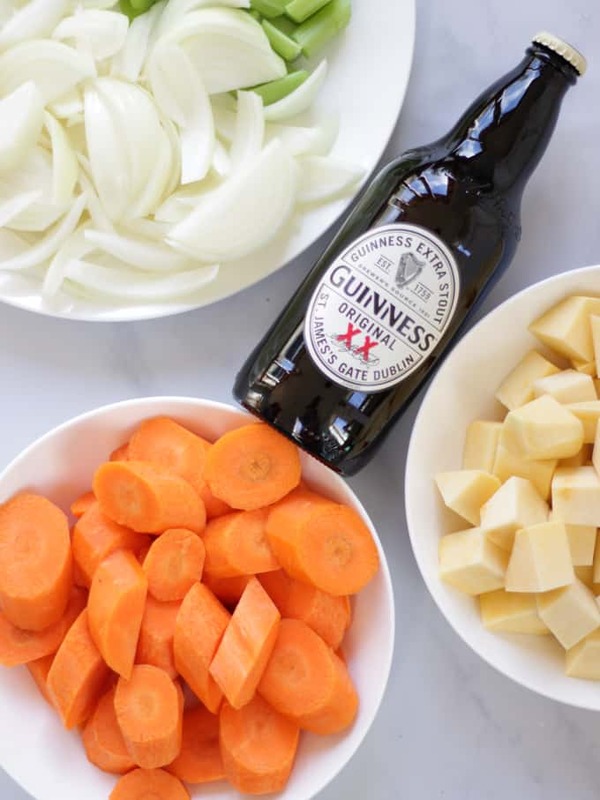 You could use an ale or other type of beer instead of the Guinness in this recipe, but it really does add a deep rich flavour. Don’t worry about using alcoholic drinks for the family, all of the alcohol will burn off during cooking. 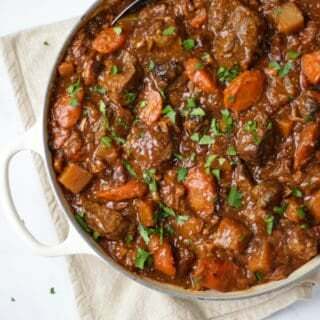 What to serve with Beef Guinness Stew? How do I make a Beef and Guinness Pie? This Beef Guinness Stew makes a brilliant filling for a Beef and Ale Pie. Just line a pie dish with ready made pastry, pop the cold filling on top, add a pastry lid, brush with a beaten egg and bake in a hot oven until golden. Can I freeze Beef Guinness Stew? Yes. This dish freezes brilliantly. When it’s cold, I portion it up into takeaway containers (I buy them in bulk from Amazon, about £8 for 50). I then defrost and warm through when needed. The sauce will thicken even more on reheating, just add a splash of water if you would like more gravy. 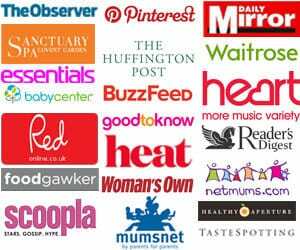 Fancy some other slow cooked beef recipes? How about my Beef Stifado or my Easy Chilli Con Carne (made with beef steak)? Hope you enjoy this recipe as much as we do. 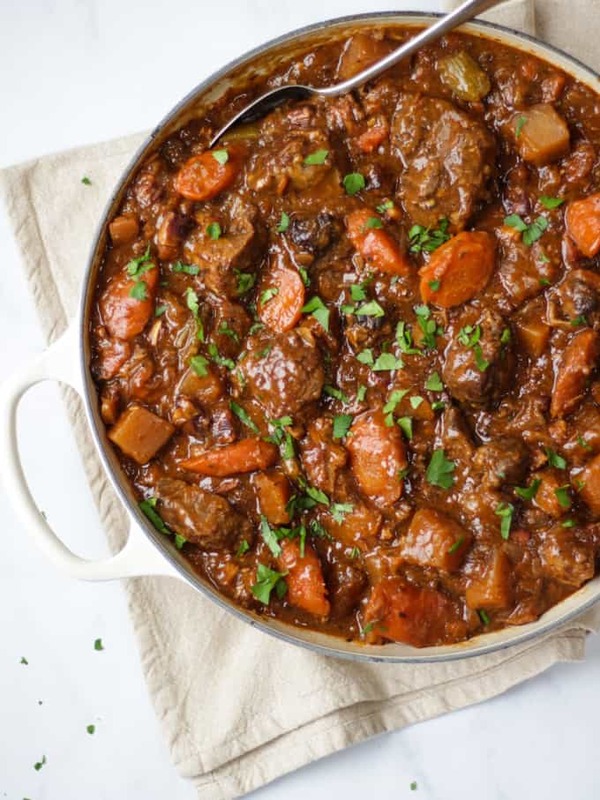 I’d love to know how you got on and what you thought of it if you make this Beef Guinness Stew recipe. Please rate the recipe and leave me a comment below if you do. Heat half of the olive oil over a high heat, fry the beef pieces in batches until brown all over. Add the rest of the oil when needed. Put the beef to one side and add the pancetta chunks to the pan. Fry until golden brown (about 5 - 10 minutes). Add the onions, garlic and celery to the pan. Fry for 5 minutes until starting to soften. Add the carrots and swede and cook for a further 5 minutes. Add the plain flour and mix to coat all of the vegetables. Cook for 5 minutes, stirring. Add the Guinness, tomato puree, thyme, beef stock and plenty of salt and pepper. Add the beef back in and give everything a good stir. Pop a lid on and put it into the oven for 2.5 - 3 hours or until the meat is meltingly soft.